Should I Invest in SEO or PPC for My Business? Some companies turn to optimizing their website for search engine optimization while others just load pay per click and get visits that way. 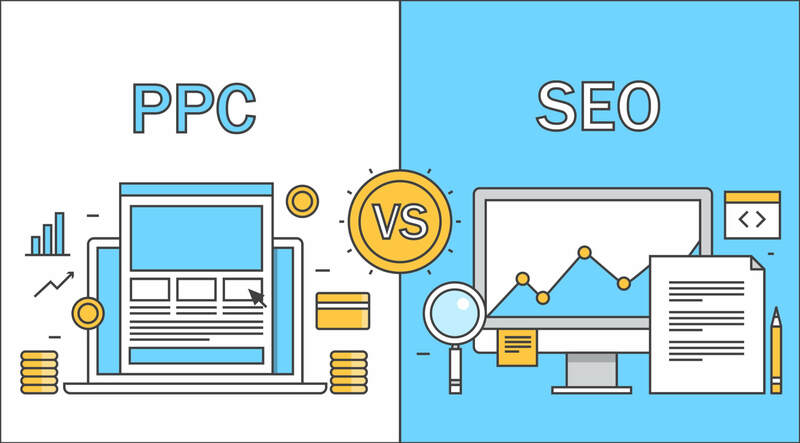 Search engine optimization (SEO) is a long-term solution which takes time and effort, while on the other hand, pay per click (PPC) is an ad that you are running and it’s a short-term solution that costs money. If you do them both correct, they can both get you on the first page of search results. People are searching on a daily basis so it’s no wonder why questions about SEO are always asked. SEO is organic traffic, meaning people finding your website by searching. SEO isn’t an overnight solution and there are a lot of factors that go into it. There isn’t a step by step guide that will guarantee results and you are done with it at a certain point. You have a better chance of getting people on your website by them searching in a search engine, than having them searching directly in a URL bar for your website. PPC is paid traffic, meaning people finding your website by you creating an ad and then clicking on the ad. PPC will always be the top result on Google and other search engines, why? Because they want to make money. You are allocating yourself a budget and everytime someone clicks on your ad, part of your budget gets used. At Boston Web Marketing, we offer both SEO & PPC services to help your business get found online. While SEO offers long-term solutions, PPC is a great way to get your business found in the interim. Through our PPC and SEO services working in tandem, clients will see an increase in both paid and organic traffic which leads to more conversions. Our team of SEO Specialists utilize new keyword researching tools to find high-volume keywords and terms relevant to your industry. Contact us today to get an SEO audit of your current site.